The LED Color Changing Flame Battery Operated Votive Candle with Decorative Glass Votive Holder is 2.5 inch tall and 2.25 inches in diameter. 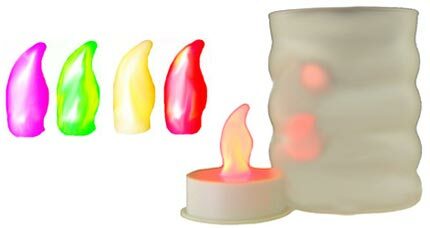 The battery operated votive candle color changing flame uses a 3 Volt Lithium cell battery. The rainbow flame colors alternate slowly between blue, green, red, pink and orange spectrums. One lithium battery is included. The lithium battery will last about 48 hours of continous use. A convient on/off switch located on the bottom of the Battery Candles allows you to turn the tea light off and on to conserve battery energy. The long-lasting flame light bulb 3 Volt CR-2032 lithium coin cell battery can be replaced. The Battery Operated Candles will fit into any standard votive candle holder. Our Battery Candles are safe, fun and perfect when you need an alternative in order to meet insurance policies and/or fire codes. These realistic battery operated tea lights and battery operated votives bring a soft glow of candle light indoors without the risk of fire, or the wax and smoke mess. Votive Battery Operated Candles are perfect for party tables, wedding table candle lights, dances, promotional events, holiday arrangements or for countless other candle uses. •The Battery Candles color changing flame light bulb for the votive candle is included. •The Battery Operated Candles are for indoor use or dry outside use. •Off and On switch to conserve the battery power. •The battery operated led candles use one 3V Lithium Cell battery will last about 48 hours. •We do have 3V Lithium Cell batteries for the candles. 3V Lithium battery stock number is CR2032. •United States UL approved battery powered electric candles. •Complete use and care instructions for the flickering flame candle is included.